The old wives tale about "sitting snow is waiting for more" came true yesterday. We had a whole load more during the evening. 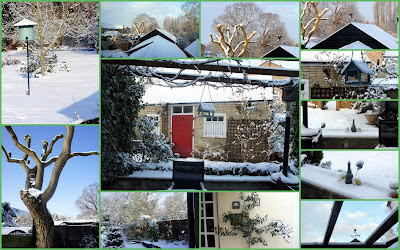 We had still got a good covering in the garden from the weekend, though the roads and paths have been clear. 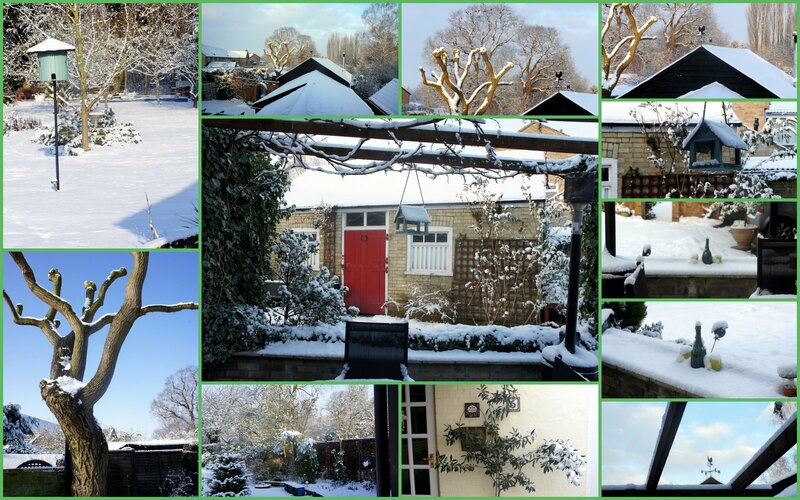 We woke to a sunny winter wonderland. Thankful that we are still poorly and not going to work. On the illness front, Rebecca is still feeling ill, totally exhausted and back in bed. Tim, doing ok. Me, doing ok and feeling much more human today. Peter, looks rubbish, its all on his chest and he is bringing up, well you just don't want to know!! Rachel has finally succumbed, bless her she called round yesterday with lemons, paracetamol, Lucozade, ginger cake and crumpets, much appreciated. The only good thing about being off work sick is that I can indulge my knitting habit. This is my first Ten Stitch Twist, which as I said I made into a bath mat. I lined it with an old bath towel, waste not want not. I have a second Twist on the go in chunky yarn, which I plan, if I have enough yarn, to make into a rug for one the the spare bedrooms. I will line this with hessian to make it a bit more robust. I also did a few more rows on the back of the In the Mood cardigan, but the Irish Moss stitch is getting boring and there is no shaping on the back so its just plain rows. I have 3 pattern sets done on the front, but my head hurts too much to concentrate at present. The snow is so pretty. We've sadly not had any. So glad you are on the upswing. I hope everyone else gets to feeling better as well. I love the bath mat. Think I am finaly going to have to try one of those ten stitches. 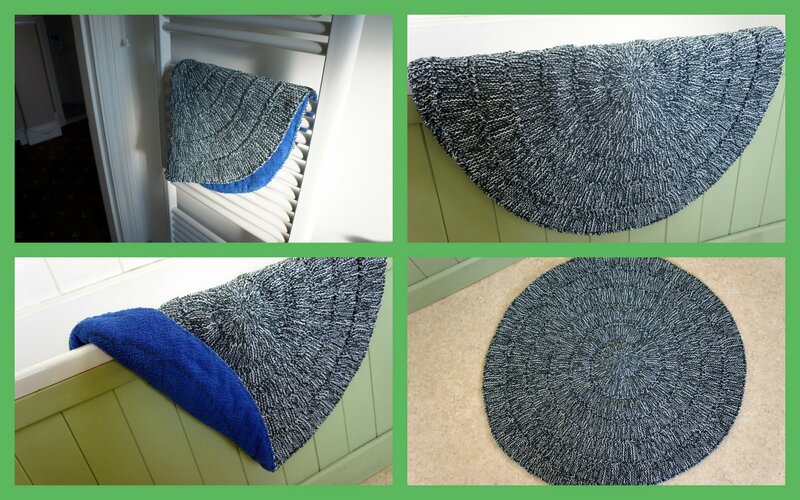 What a great idea - lining a ten-stitch mat with an old towel. I hope you don't mind if I "borrow" that idea! Yours is fab! Hope all heal soon. Love the mat. Hooray for knitting time! I like the idea of using an old towel to line the bath mat. I need to remember that idea. Wow, I hope you are all feeling better very quickly! Relax and recuperate. I totally love your idea of using the 10 stitch blanket as a bath mat - I think I might end up doing the same! I hope you are feeling 100% soon! I haven't seen a bath mat like that before. Great idea! hmmmm, something for me to think about making. I love the rugs ... I've only made a couple, and they were always so slippery I couldn't use them as rugs! The sweater is looking great, and I love the mat!! Oh the snow... we have a dusting so far since Halloween. It's a little upsetting for a snow gal like me. :) The rugs are something new for me... love how they came out. Feel better soon, my dear!